Maybe you bought a plant from a nursery, repotted it, and tossed the identification marker or you can't recall the names from that growing collection of potted plants. Knowing whether it's an upright or hanging plant helps, along with looking closely at the shape of its leaves, color, pattern, and if the plant produces flowers. 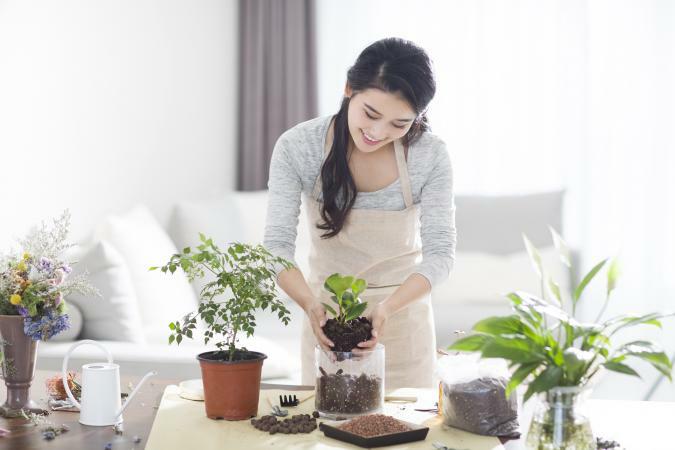 While there are thousands of plants that can be grown indoors, the ones that are perennially popular are sold at nurseries and garden centers for a reason. Some are strong despite your lack of a green thumb while other more sensitive specimens may require certain plant food, just the right lighting, and a special kind of container. 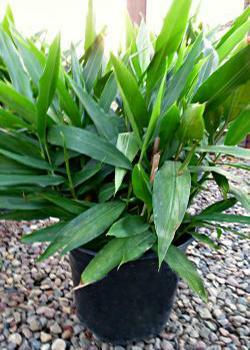 This pretty plant (Alpinia galanga) is a form of ginger and is frequently used in Thai and Indonesian cooking. Also known as Galangal, Greater Galangal, or Thai Galangal, this increasingly popular house plant grows from edible rhizomes that produce stalks with long, thin, green leaves. Because it hails from tropical climates, Galanga prefers humidity. Anthurium plants actually grow in the forests of tropical regions like Hawaii, although they are in containers inside in many areas of the U.S. Also known as Flamingo Flowers or Tailflowers, Anthuriums produce shiny, waxy flowers in white, coral, pink, rose, or deep red with long, cone-like yellow centers. 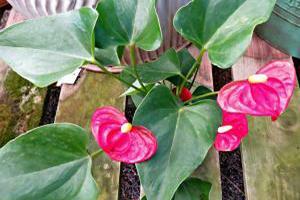 When not in bloom, Anthurium can still be identified by its vivid green, glossy oblong, heart-shaped leaves. 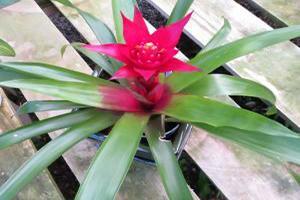 Indoor gardening enthusiasts love the 3,000+ species of Bromeliads for their colorful and varied flowers and foliage. 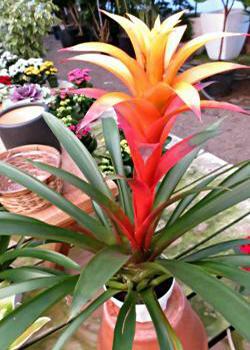 Sometimes referred to as Urn Plants or Pineapple Plants, Bromeliads produce vivid rosette-shaped flowers that become fountain-shaped as they grow, surrounded by leaves that can be strappy, wide and toothed, or variegated. While Bromeliads are monocarpic, meaning the bloom of a stunning flower indicates the plant's life is ending, most produce offsets. 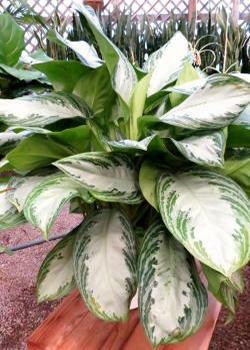 Although Chinese Evergreen (Aglaonemia modestum) produces small, greenish-white flowers that resemble Calla Lilies, this tropical Asian plant is admired for its broad leaves with white centers and green stripes on the edges. 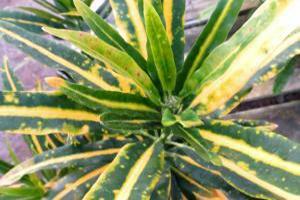 It grows in clumps to about 3 feet high and wide and is easy to grow. 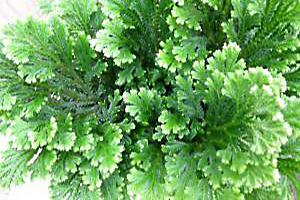 Resembling bright green, ruffle-edged gourmet lettuce, Clubmoss (Selaginella kraussiana) is a tropical house plant that is ideal for glass terrariums. 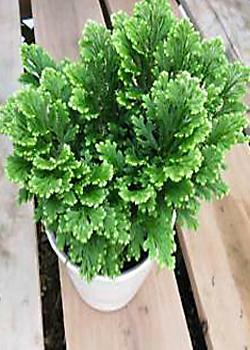 Also called Frosty Fern and Spike Moss, it has quickly spreading, creeping stems with branching, lacy foliage and light green or white tips that look "frosted". While it doesn't produce actual figs, Creeping Fig (Ficus pumila) has a climbing, almost invasive habit in nature as it attaches to walls and fences. Contained as an indoor plant, Creeping Fig makes an attractive indoor hanging plant, with trailing stems and oval leaves. 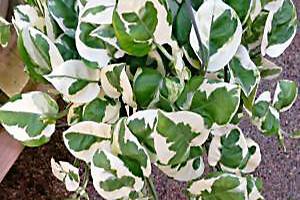 'Varigata' has creamy white and green leaves. 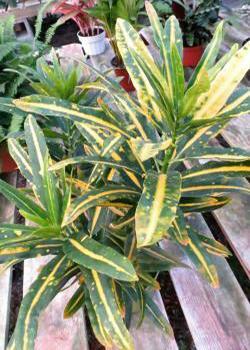 Large, leathery leaves in any combinations of green, yellow, pink, red, white, and orange make Crotons (Codiaeum variegatum) a colorful interior accent. 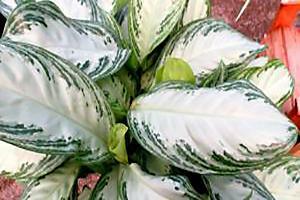 Croton's glossy leaves can be oval or long and narrow, with edges that vary from smooth to lobed. Fiddle Leaf Fig (Ficus lyrata) trees are tall, broad-leafed plants that are enjoying a resurgence in popularity, thanks to an abundance of design websites and social media. 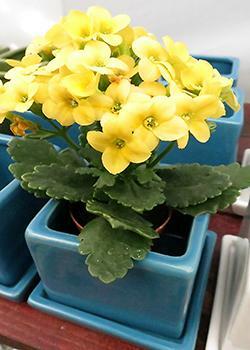 Nurseries in larger cities can't keep them in stock. Why? 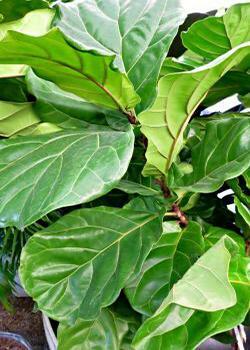 They look good with a variety of design styles and their large (up to 15 inches long), fiddle-shaped, round leaves add personality and structure to a room and are fairly easy to grow. 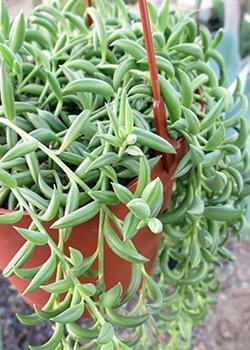 A trailing succulent, Fishhook Plant (Senecio radicans) is a hanging plant with tiny banana-shaped "leaves" that also goes by the name of String of Bananas and Banana Vine. 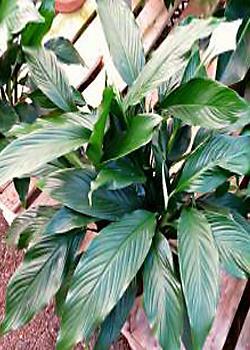 Picture the tail of a goldfish and you can understand how Fishtail Palm (Caryota) got its common name. 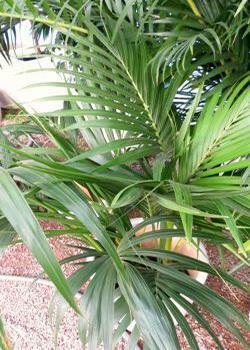 With dark green feather palms, its leaves are divided and make leaflets that are flattened and split at the ends. 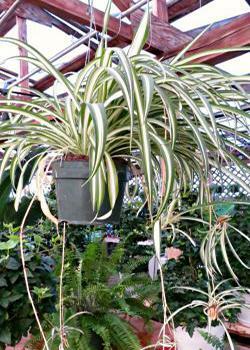 Indoor plants usually grow to about 10 feet high. 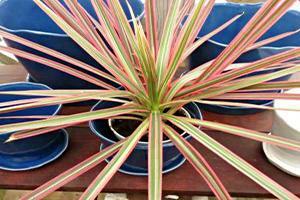 Many species of Dracaena make ideal houseplants, but, they don't all look alike. 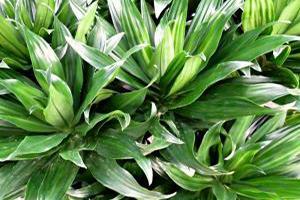 'Janet Craig' Dracaena (Dracaena deremensis) grows on tall stalks and produces clusters of dark green sword-shaped leaves. 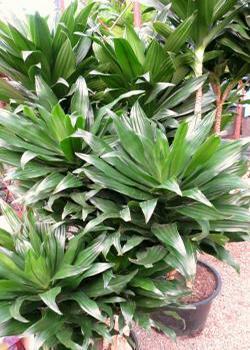 A smaller version is Dracaena compacta. Sold everywhere from garden centers to florists to grocery stores, these tiny-bell-shaped flowered houseplants are actually succulents that bloom in an array of colors like yellow, white, pink, red, and orange. 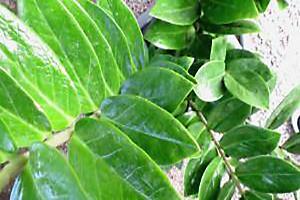 Their dark green leaves are fleshy and moist with edges that are smooth or lobed. 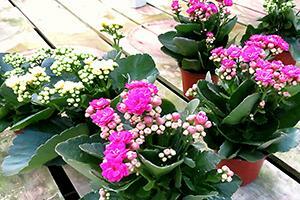 Kalanchoes usually bloom in winter and early spring. The name alone entices even non-plant lovers to buy one. 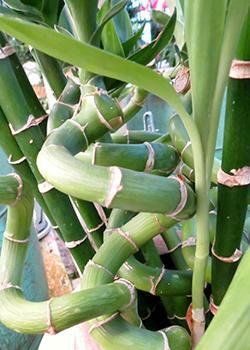 Lucky Bamboo (Dracaena sanderiana), aka Ribbon Plant or Chinese Water Bamboo, is an easy-to-grow plant that is not a true bamboo. 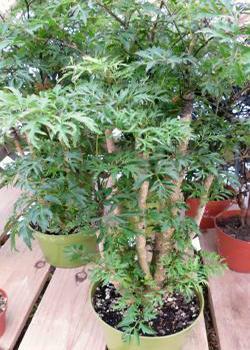 Stems are upright or twisting, with green, thin, strappy leaves that are light to medium green. 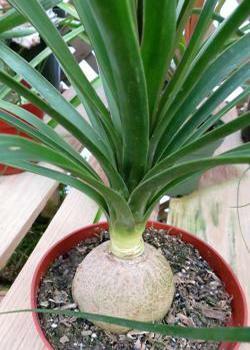 A member of the Agave family, (Dracaena marginata) is also known as the Money Tree -- who wouldn't want one of those growing in their house? Dragon Tree is noted for its slender upright or spreading stems with clusters of blade-shaped leaves that range from deep olive to variegated green with yellow and red or red tipped. The more colorful varieties are 'Colorama' and 'Tricolor'. 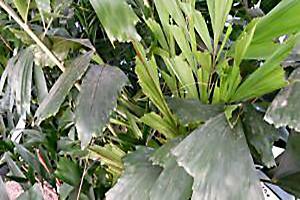 A tropical-looking tree-like house plant from Polynesia, the leaves of Ming Aralila (Polyscias fruticosa) are divided and redivided into lots of serrated sections. 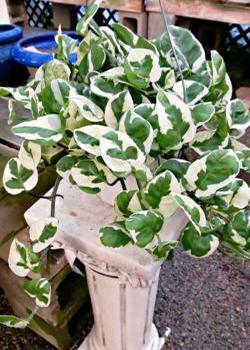 This upright-growing houseplant likes frequent misting. 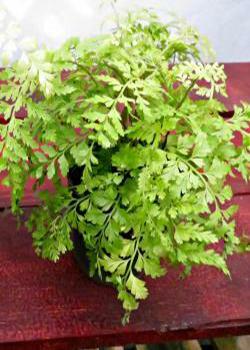 Mother Fern (Asplenium bulbiferum) features light green, graceful yet leathery fronds that are finely cut. 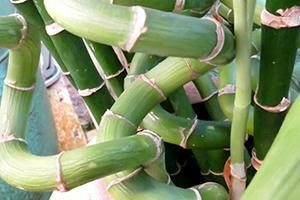 Tiny plantlets grow on the long fronds; these "babies" can be removed and propagated in fresh soil for new plants. 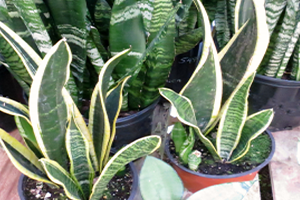 The unforgettably named Mother-in-Law Tongue (Sansevieria trifasciata) is also known as Snake Plant and is a member of the Agave family. 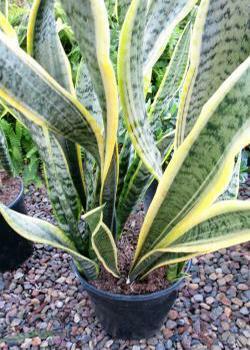 While some varieties are dwarf, its thick, stiff, upright leaves that are striped or patterned are unmistakable. Colors range from different shades of green to yellow, white, and cream. 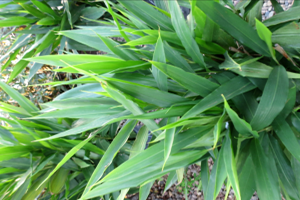 While the dark green leaves of this tropical plant are attractive, it's the big bulbous base that helps to identify this Mexican native. 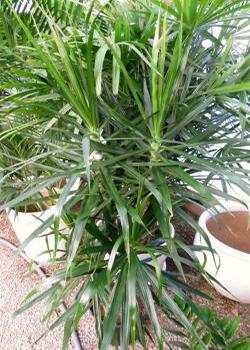 Ponytail Palm (Beaucarnea recurvata) is a member of the lily family and not an actual palm. The bases and trunks of older specimens can measure several feet across and can take on a sculptural quality. Its long, strappy leaves can be trimmed if it gets too "wild" looking. 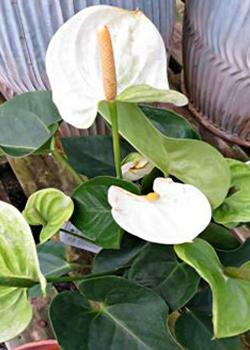 While a Peace Lily (Spathiphyllum) produces thin white flowers with yellow centers (spadix) that resemble thin Calla Lilies, it's when the plant is in its non-blooming state that it's harder to identify. Most varieties produce a profusion of long, dark, glossy green elliptical leaves on slender stalks that together form a fountain-like shape. 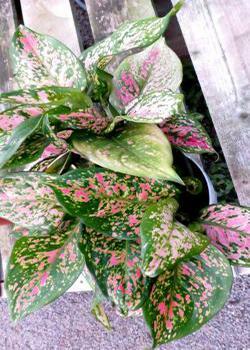 Polka Dot Plant, or Freckle Face (Hypoestes phyllostachya), is easy to spot because of its light-to-medium pink or white and dark green spotted leaves. Oval, 2- to 3-inch leaves grow on slender stems and spots are irregular. 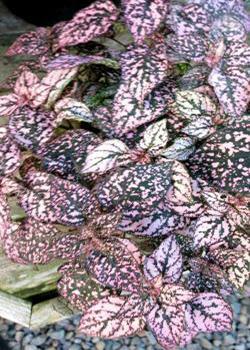 A petite plant that rarely grows beyond 10 inches tall, Poka Dot looks best if tip-pinched to encourage fullness. Freckle Face will be happiest growing in a loose, peat soil mixture. 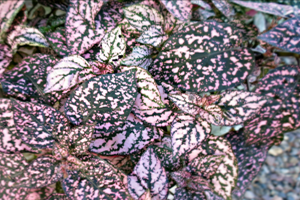 Although it's often pink and green, Red Aglaonema has reverse heart-shaped leaves that are spotted, variegated, and edged in various shades of pink, rose, red, yellow, and green. 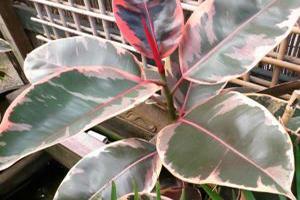 One of the easiest house plants to grow, Red Aglaonema can tolerate rooms with poor lighting. 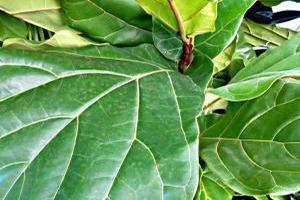 Noted for its large, leathery, dark green or variegated red, green, and white leaves, Ficus elastica is also known as Rubber Fg, Rubber Bush, Rubber Plant, Indian Rubber Bush, and Indian Rubber Tree. 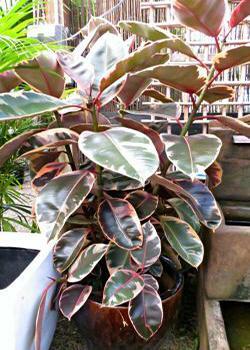 Rubber Tree stalks are stiff, upright, and often red. 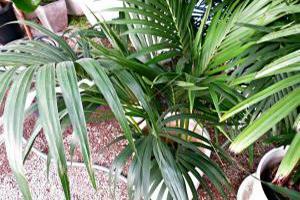 Long ago, Parlor Palms (Chamaedorea elegans) provided some greenery in the parlors of houses. Parlors were private rooms in homes of the more well-to-do, and were spaces where families might hold special meetings, weddings, or funerals. 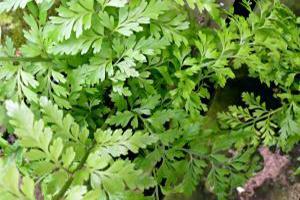 The plants are still popular for their classic, feathery arching fronds that grow on single stems. 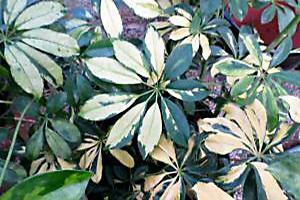 Schefflera, or Hawaiian Schefflera, is a tropical plant with shiny, round, palmate green or cream and green variegated leaves and woody stems. 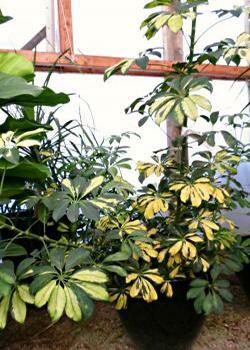 Schefflera grow on long stalks and form finger- or petal-like leaflets that can be dark or light green or variegated. 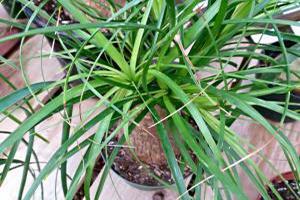 Spider Plants (Chlorophytum comosum) get their name from the clumps of grass-like blades that look like the legs of a spider. 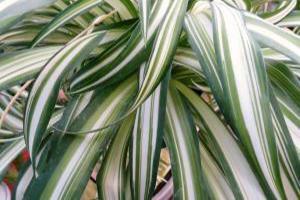 Best as hanging plants, Chlorophytum usually have green and white striped leaves and produce "babies" with roots at the ends of long stems. 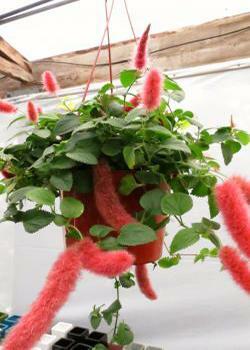 This hanging houseplant hails from the South Pacific has fuzzy, chenille or caterpillar-shaped red blooms. Strawberry Firetails (Acalypha hispida) has bright green heart-shaped leaves with toothed edges and literally spills from its container. 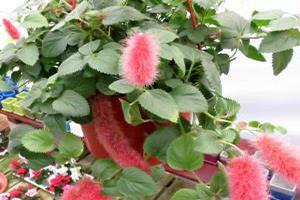 It's also called Foxtails, Monkey Tail, and Red-Hot Cat's Tail. 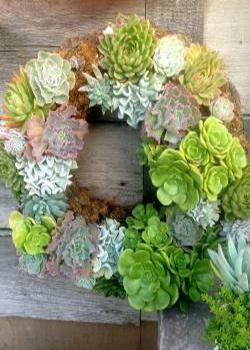 Sometimes referred to as hens and chicks, succulents encompass more than 50 genera and share the ability to store water in their fleshy leaves, stems, and roots. 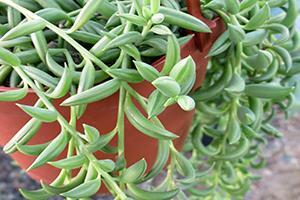 Succulents can be found in a variety of shapes, colors, and sizes, but smaller varieties make excellent houseplants, especially those without spines. 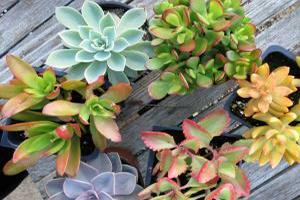 Types include Echeveria, Euphorbia (like the Poinsettia), Aeonium, and Cotyledon. 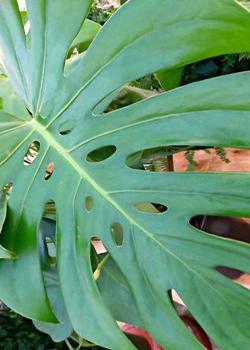 With random holes in its monstrous leaves, there's no question why this is called Swiss Cheese Plant (Monstera deliciosa). 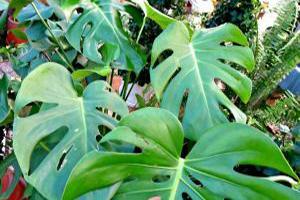 A relative of Philodendrons, Swiss Cheese Plant has huge, dark glossy green tropical looking leaves that are deeply cut with holes or perforations. Younger leaves are brighter green and uncut. 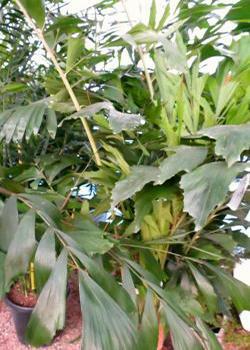 Inside, Monstera can climb to 15 feet in height. 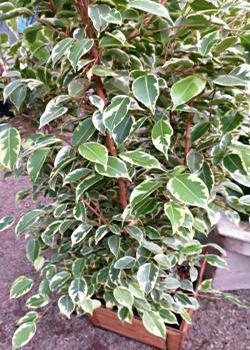 Weeping Fig (Ficus benjamina) is a longtime favorite for indoor trees. 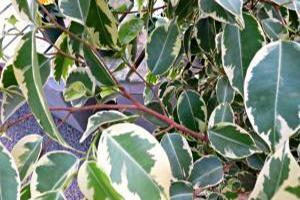 Also known as Benjamin Tree or Benjamin Fig, it produces green or variegated green and white oval-shaped leaves with pointed tips that grow on downward dropping stems. Some specimens feature braided trunks. 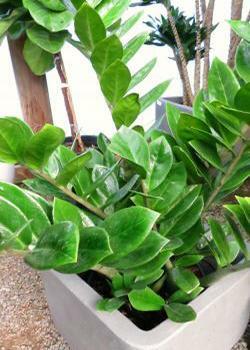 Zanzibar Gem (Zamioculcas zamiifolia), or ZZ Plant, resembles a cycad or palm but is a relative of the Calla Lily. 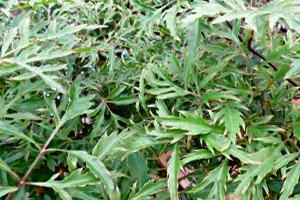 Long leafstalks have six to eight pairs of shiny, waxy, oval-shaped dark green leaves. 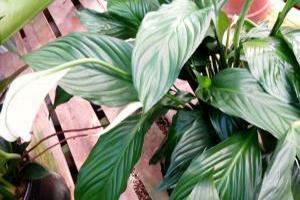 Learning about the common house plants can help you decide what to select. 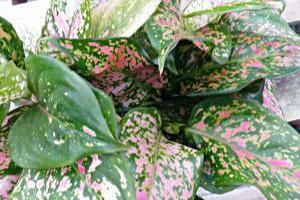 Add a splash of color and some of Mother Nature's beauty to your home with a house plant.